Manual Exposure, Bulb Setting, Lightning…. With the bulb setting, the shutter will remain open for as long as you hold down the shutter release. Note – you may want to get a remote shutter release that’s capable of locking the shutter open otherwise your finger is going to get mighty tired. It’s best if you can do this indoors through a window – for a variety of reasons. Note – indoor & outdoor lights may ruin the shot. If there is lots of brightening of the sky with no bolts, you may want to close & reopen the shutter every minute or so. 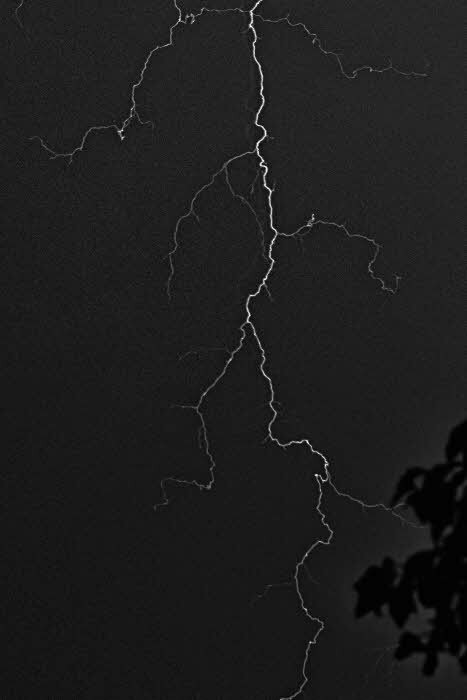 If you don’t – depending on your settings – the image may end up too bright and the contrast between the sky and the lightning bolt – when it finally appears – will be too low. Again, experiment. Here’s what you get (done last night through my bedroom window; lots of racket kept me up so why not make hay while the sun shines – or lightning images when it storms). This entry was posted in Exposure and tagged Photography, Photography How To, Photography Technique, Photography Tips, Photography Tutorial by Ed Knepley. Bookmark the permalink.